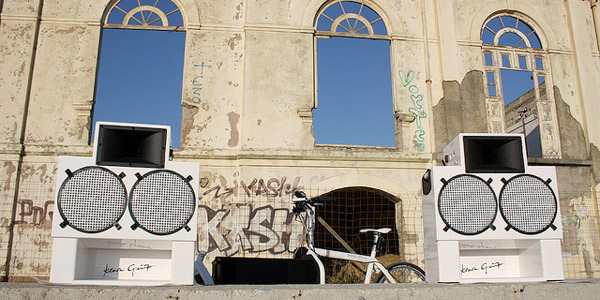 HOME > Jamaica > Jamaican Style > Klara Geist – Beautiful soundsystems made in Berlin. Klara Geist – Beautiful soundsystems made in Berlin. I think every Jamaica-phile would agree that almost as important as its sound, is the aesthetics of a soundsystem. Klara Geist, a two-people operation in Berlin, masters both disciplines. They build beautiful sondsystems for mobile and stationary use. My personal favourite – even if I don’t own a Bullit bike for which it was designed to be used with – is »The Transfomer« (see image above). The combination of balanced design and new technology makes this portable PA one of the most powerful systems on the world market. For more information on The Transformer and their other models, visit the Klara Geist website, and check out their flickr photo stream for some nice behind the scenes photographs from their workshop.